Many things in life are listed as one size fits all. The reality is that this statement is never 100 percent accurate. The fact of the matter is that people are tall, short and everything in between, so there is no way that one size can accommodate everyone’s needs. The Golden Comforter Extra Wide - PR502 was designed to provide people who need more spacious living room furniture with a comfortable seating option. Golden lift chairs were designed to have unmatched safety and provide the most protection to its patients. 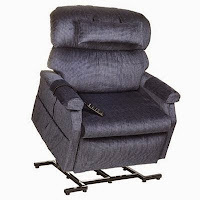 This extra wide recliner has a 33” wide seat and weight capacity of 700 lbs. The PR-502 uses three motors to control all the functions of the chair. Two of these motors control the back and footrests, which can both recline 65 degrees. It comes with a six-button hand control that allows you to customize your settings, including seat lowering, inclination and adjustments for your back and legs. The ability to tilt downwards also makes it easier for a chair transition or to bring you to a standing position. When it comes to medical furniture, the pieces can often look clinical and uncomfortable. This Golden Technologies lift chair comes in a variety of fabrics and colors, so it can fit right in with your living room set. Choose from vinyl, cryton, velvet, or brisa fabric in any color you could think of. Underneath the fabrics are comfy filler materials to prevent the motorized chair from having any sagging or an overall worn down look. The overstuffed armrests provide you with comfort and security while the chair is moving. You will love the support that your body receives from this chair. Order this heavy duty lift chair to maximize your comfort. Special delivery and setup included when you purchase today!